It never ceases to amaze me the lengths at which some players will go to cheat at games because they aren’t good enough to get anywhere otherwise or they are too lazy to actually improve their skills to master a game. Personally I find cheating in a game boring, which stems from the time when you had God Mode in Doom. I quickly found for myself that taking the challenge out of the game didn’t make it exciting or fun. Unfortunately many other players don’t seem to find it boring at all and will go to any length to cheat to gain some sort of personal glory they can’t get based on their skills alone (this is one factor that makes many online games more frustrating than fun). 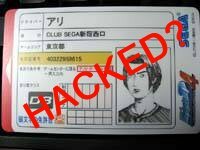 Stinger reports that Sega has been monitoring a number of unusual incidents where it appears that players have hacked the IC data cards used on their new racing title Initial D4. Players on an Initial D forum have confirmed seeing hacked cards in operation. Unless Sega discovers some way to stop this it could also mean that games such as Tekken 6 and Virtua Fighter 5 will be susceptible to similar attacks by untalented players (my own emphasis on the untalented part). I really do hope that Sega will come up with a way to prevent this – one thing I love about arcades is that the players generally cannot modify the game itself so it’s their own skill or nothing.